Cultural Front: What if contemporary African American poetry had Black Arts-like scholarly support? What if contemporary African American poetry had Black Arts-like scholarly support? I sometimes wonder: what if contemporary African American poetry had a Tony Bolden or James Smethurst? That is, what if contemporary African American poetry had established scholars producing extensive work in the area? I sometimes refer to Bolden and Smethurst in shorthand like that because they were on the front end of an important surge in the scholarly discourse on Black Arts poetry, and cultural production of the 1960s and 1970s in general. (Not necessarily the first, as black arts critical discourse has been constant in some form or another since the 1960s). Along with Bolden and Smethurst, you had Aldon Nielsen, Melba Joyce Boyd, Joanne Gabbin, Cheryl Clarke, Margo Crawford, Evie Shockley, Meta DuEwa Jones, Jean-Philipe Marcoux, Kathy Lou Schultz, Virginia C. Fowler, Carter Mathes, and so forth. My own book, The Black Arts Enterprise, is situated within works by those scholars. Although Kalamu ya Salaam's The Magic of Juju: An Appreciation of the Black Arts Movement (2016) was published last year, his completed manuscript had been circulating underground as early as the late 1990s. Back in 1991, David Lionel Smith wrote an article noting that "the silence regarding the Black Arts Movement is deafening." The far-reaching body of work produced by Black Arts writers, scholars, and organizers has combated that silence. I'm not sure what it will take for something similar to take place with contemporary African American poetry -- not to say that anyone is interested. As a group, contemporary black poets have attained remarkable recognition in terms of awards and prizes, support from the National Endowment for the Arts, and academic appointments. There has not, however, been comparable scholarly interest. 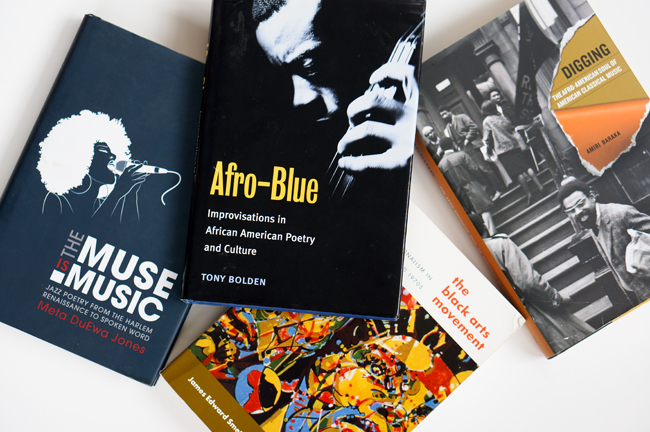 Scholars tend to concentrate on historically significant or canonical authors, so it might be too early to expect extended studies on contemporary African American poetry. Then too, in realms of contemporary poetry, I sense greater distance between "poets" and "scholars" than in black arts discourse. Even during the 1960s and 1970s, poets, scholars, and poet-essayists, like Eugene B. Redmond, Amiri Baraka, Sarah Webster Fabio, Larry Neal, and Carolyn Rodgers, were actively involved in producing critical interpretations. I predict that select groups of contemporary African American poets will continue to do really well in terms of awards and support. But what about the scholarly discourse? What will it take to make contemporary poetry mean something to folks who aren't contemporary poets?